View from inside World Bank Headquarters Washington, DC. The World Bank Group is a group of five international organizations responsible for providing finance and advice to countries for the purposes of economic development and eliminating poverty. The Bank came into formal existence on December 27, 1945 following international ratification of the Bretton Woods agreements, which emerged from the United Nations Monetary and Financial Conference (July 1 - July 22, 1944). Commencing operations on June 25, 1946, it approved its first loan on May 9, 1947 ($250m to France for postwar reconstruction, in real terms the largest loan issued by the Bank to date). Following decolonization, many African countries were ruled by dictators. Some corrupt dictators are alleged to have stolen much of the financial support lent by the World Bank, International Monetary Fund, and other lenders, suggesting a lack of oversight by the World Bank and leaving a legacy of enormous national debt in these recipient nations. However, World Bank standards and methods such as transparent procedures for competitive procurement and environmental standards for project evaluation are highly valued by some, and have been adopted successfully in some areas. By convention, the United States nominates the head of the World Bank as the biggest donor, while the Europeans nominate the head of the IMF. This arrangement is criticized by many as a mechanism that allows the US to exercise undue influence. The appointment in June 2005 of Paul Wolfowitz as the Bank's 10th President created controversy because in his previous role within the Bush administration as deputy defense secretary he had been a leading advocate of the invasion of Iraq, which many countries that benefit from the Bank oppose. He resigned May 17 2007 following an investigation into his handling of a promotion for his girl-friend. Rumors, however, circulate that his resignation was engineered by people who were implicated by his campaign against corruption within the Bank . Nobel Peace Prize winner Muhammad Yunus has also criticized the Bank for "all but ignoring tiny loans for impoverished people" although the Bank claims to be "committed to microcredit" . The World Bank's activities are focused on developing countries, in the fields of human development (education, health), agriculture and rural development (irrigation, rural services), environmental protection (pollution reduction, establishing and enforcing regulations), infrastructure (roads, urban regeneration, electricity), and good governance (anti-corruption, legal institutions development). The IBRD and IDA provide loans at preferential rates to member countries, as well as grants to the poorest countries. Loans or grants for specific projects are often linked to wider policy changes in the sector or the economy. For example, a loan to improve coastal environmental management may be linked to development of new environmental institutions at national and local levels and to implementation of new regulations to limit pollution. The activities of the International Finance Corporation and Multilateral Investment Guarantee Agency include investment in the private sector and providing insurance. The World Bank Institute is the capacity development branch of the World Bank, which provides training and other capacity building programs to member countries. Five affiliated agencies created between 1956 and 1988 make up the World Bank Group. The Group's headquarters are in Washington, D.C. It is an international organization owned by member governments. It makes a profit, but the profit is used to support continued efforts in poverty reduction. Technically, the World Bank is part of the United Nations system, but its governance structure is different. Each institution in the World Bank Group is owned by its member governments, which subscribe to its basic share capital, with votes proportional to shares held. Membership gives certain voting rights that are the same for all countries but there are additional votes which depend on financial contributions to the organization. As of November 1, 2006 the United States held 16.4 percent of total votes, Japan 7.9 percent, Germany 4.5 percent, and the United Kingdom and France each held 4.3 percent. As major decisions require an 85 percent super-majority, the U.S. can block any such major change. The International Bank for Reconstruction and Development (IBRD), established in 1945, which provides debt financing on the basis of sovereign guarantees. The International Finance Corporation (IFC), established in 1956, which provides various forms of financing without sovereign guarantees, primarily to the private sector. The International Development Association (IDA), established in 1960, which provides concessional financing (interest-free loans or grants), usually with sovereign guarantees. The International Centre for Settlement of Investment Disputes (ICSID), established in 1966, which works with governments to reduce investment risk. The term "World Bank" generally refers to the IBRD and IDA , whereas the World Bank Group is used to refer to the five agencies collectively. Governments can choose which of these agencies to join as members. The IBRD has 185 member governments, and the other institutions have between 140 and 176 members. The institutions of the World Bank Group are all run by a Board of Governors that meet once a year. Each member country appoints a governor, generally its Minister of Finance. The World Bank Group's day to day operations are run by a Board of 24 Executive Directors to whom the governors have delegated certain powers. Each Director represents either one country (for the largest countries), or a group of countries. Executive Directors are appointed by their respective governments or the constituencies. The agencies of the World Bank are each governed by their Articles of Agreement that serve as the legal and institutional foundation for all of their work . The Bank also serves as one of several Implementing Agencies for the UN Global Environment Facility (GEF). By convention, the Bank President has always been nominated by the U.S. President and is a US citizen. By the same convention, the Managing Director of the IMF has been a European. Although nominated by the US Government, the World Bank President is subject to confirmation by the Board of Governors. The World Bank President serves a term of five years, which may be renewed. The World Bank Group was recently headed by Paul Wolfowitz. He was appointed on June 1, 2005 but was forced to resign on May 17, 2007. Wolfowitz, a former United States Deputy Secretary of Defense, was nominated by George W. Bush to replace James D. Wolfensohn. It came to light that Wolfowitz had used his influence to transfer his girlfriend out of the World Bank to the State Department for a significantly higher income job. The controversy surrounding this decision and other criticism about his aloof leadership style brought him down. On May 30, 2007, U.S. President George W. Bush nominated Robert Zoellick to be the next President of the World Bank. Zoellick is a former U.S. Trade Representative and former U.S. Deputy Secretary of State. At the time of his nomination, he was an executive with Goldman Sachs. The nomination is subject to approval by the World Bank Board of Directors. The World Bank has long been criticized by a range of nongovernmental organizations and academics, notably including its former Chief Economist Joseph Stiglitz, who is equally critical of the International Monetary Fund, the US Treasury Department, and US and other developed country trade negotiators. The Bank's own internal evaluations have drawn negative conclusions. Critics argue that the so-called free market reform policies — which the Bank advocates in many cases — are often harmful to economic development if implemented badly, too quickly ("shock therapy (economics)"), in the wrong sequence, or in very weak, uncompetitive economies. In Russia, for example, some have suggested that it was an apparent shock therapy policy that has significantly raised the number of people living in poverty from 2 million to 60 million, a 3000 percent increase. Following decolonization, many African countries were ruled by dictators. Some corrupt dictators are alleged to have stolen much of the financial support lent by the World Bank, IMF, and other lenders, suggesting a lack of oversight by the World Bank and leaving a legacy of enormous national debt in these recipient nations. However, World Bank standards and methods such as transparent procedures for competitive procurement and environmental standards for project evaluation are highly valued by some, and have been adopted successfully in some areas. 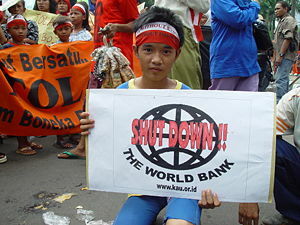 A young World Bank protester takes to the street in Jakarta, Indonesia. 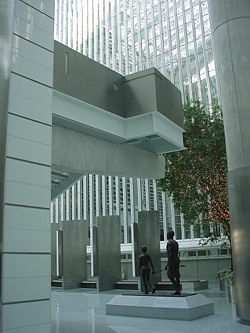 Although relied upon by poor countries as a contributor of development finance, the World Bank is often criticized, primarily by opponents of corporate "neo-colonial" globalization. These advocates of alter-globalization fault the bank for what they believe are policies and procedures that undermine national sovereignty of recipient countries. A related accusation is that the Bank operates under essentially "neo-liberal" principles. In this perspective, reforms born of "neo-liberal" inspiration are not always suitable for nations experiencing conflicts (ethnic wars, border conflicts, etc. ), or that are long-oppressed (dictatorship or colonialism) and do not have stable, democratic political systems. There is suspicion in some circles that the Bank is under the marked political influence of certain countries (notably, the United States) that would profit from advancing their interests. Those who hold this view suspect the World Bank would favor the installation of foreign enterprises, to the detriment of the development of the local economy and the people living in that country. In her book Masters of Illusion: The World Bank and the Poverty of Nations (1996), author Catherine Caufield makes a sharp criticism of the assumptions and structure of the World Bank operation, arguing that it harms southern nations rather than promoting them. Caufield criticizes the highly homogenized and Western recipes of “development” held by the Bank. Caufield takes the stand that, to the World Bank, different nations and regions are indistinguishable, and ready to receive the “uniform remedy of development.” The danger of this assumption is that to attain even small portions of success, western approaches to life are adopted and traditional economic structures and values are abandoned. Caufield presents a second assumption held by the World Bank, that poor countries cannot modernize without money and advice from abroad. She suggests that this generates a cycle of indebtedness that with the payment of interest means a huge net transfer from the poor to the rich nations each year. Caufield criticizes two elements in the structure of the World Bank. First, the structure of repayment; the Bank is a lender of foreign currency and demands to be repaid in the same currency. The borrower countries, in order to obtain the currencies to repay the loans, must sell to the rich countries more than they buy from them. However, the rich countries want to be net exporters, not importers. This generates “the transfer problem,” often the only way of repaying loans is to engage in other loans, resulting in an accumulation of debts. Second, she criticizes the high influence of the bank over national sovereignty. As a condition of the credit, the Bank offers advice on how countries should manage their finances, make their laws, provide services, and conduct themselves in the international market. The Bank has great power of persuasion, because if it decides to ostracize a borrower, other major international powers will follow the lead. On top of this, by excessive lending, the Bank has added to its own power and depleted that of its borrowers, generating a blatant inconsistency with its stated mission. In debates about the World Bank's role, the arguments are complex and often rely as much upon political judgment as economic proof. For example, in the 2005 Massey Lecture, entitled "Race Against Time," Stephen Lewis argued that the structural adjustment policies of the World Bank and the International Monetary Fund have aggravated and aided the spread of the AIDS pandemic by limiting the funding allowed to health and education sectors. However, it should also be noted that, although finances hardly help stop the spread of the AIDS pandemic, the World Bank is a major source of funding for combating AIDS in poor countries, and in the past six years it has committed about US$ 2 billion through grants, loans and credits for programs to fight HIV/AIDS. Throughout the period from 1972 to 1989, the Bank did not conduct its own environmental assessments and did not require assessments for every project that was proposed. Assessments were required only for a varying, small percentage of projects, with the environmental staff, in the early 1970s, sending check-off forms to the borrowers and, in the latter part of the period, sending more detailed documentation and suggestions for analysis. During this same period, the Bank’s failure to adequately consider social environmental factors was most evident in the 1976 Indonesian Transmigration program (Transmigration V). This project was funded after the establishment of the Bank’s OESA (environmental) office in 1971. According to the Bank critic Le Prestre, Transmigration V was the “largest resettlement program ever attempted… designed ultimately to transfer, over a period of twenty years, 65 million of the nation’s 165 million inhabitants from the overcrowded islands of Java, Bali, Madura, and Lombok…” (175). The objectives were: relief of the economic and social problems of the inner islands, reduction of unemployment on Java, relocation of manpower to the outer islands, the “strengthen[ing of] national unity through ethnic integration, and improve[ment of] the living standard of the poor” (ibid, 175). Putting aside the possibly Machiavellian politics of such a project, it otherwise failed as the new settlements went out of control. Local populations fought with the migrators and the tropical forest was devastated (destroying the lives of indigenous peoples). Also, “[s]ome settlements were established in inhospitable sites, and failures were common;” these concerns were noted by the Bank's environmental unit whose recommendations (to Bank management) and analyses were ignored (Le Prestre, 176). Funding continued through 1987, despite the problems noted and despite the Bank’s published stipulations (1982) concerning the treatment of groups to be resettled. More recent authors have pointed out that the World Bank learned from the mistakes of projects such as Transmigration V and greatly improved its social and environmental controls, especially during the 1990s. It has established a set of "Safeguard Policies" that set out wide ranging basic criteria that projects must meet to be acceptable. The policies are demanding, and as Mallaby (reference below) observes: "Because of the combined pressures from Northern NGOs and shareholders, the Bank's project managers labor under "safeguard" rules covering ten sensitive issues … no other development lender is hamstrung in this way" (page 389). The ten policies cover: Environmental Assessment, Natural Habitats, Forests, Pest Management, Cultural Property, Involuntary Resettlement, Indigenous Peoples, Safety of Dams, Disputed Areas, and International Waterways . The Independent Evaluation Group (IEG) (formerly known as the Operations Evaluation Department (OED)) plays an important check and balance role in the World Bank. Similar in its role to the US Government's Government Accountability Office (GAO), it is an independent unit of the World Bank that reports evaluation findings directly to the Bank's Board of Executive Directors. IEG evaluations provide an objective basis for assessing the results of the Bank's work, and ensuring accountability of World Bank management to the member countries (through the World Bank Board) in the achievement of its objectives. The World Bank provides summer internships to local DC students at its headquarters every year. This youth development program is a large investment in the city's youth and the World Bank partners with a local nonprofit, Urban Alliance Foundation, to provide this opportunity. ↑ The World Bank. Retrieved May 15, 2008. ↑ . The World Bank. Retrieved May 15, 2008. ↑ . Retrieved May 15, 2008. ↑ , July, 2005. The World Bank. Retrieved May 15, 2008. "It is time to free the World Bank" Article by Jeffrey Sachs, March 2005. This page was last modified on 3 August 2013, at 16:49.